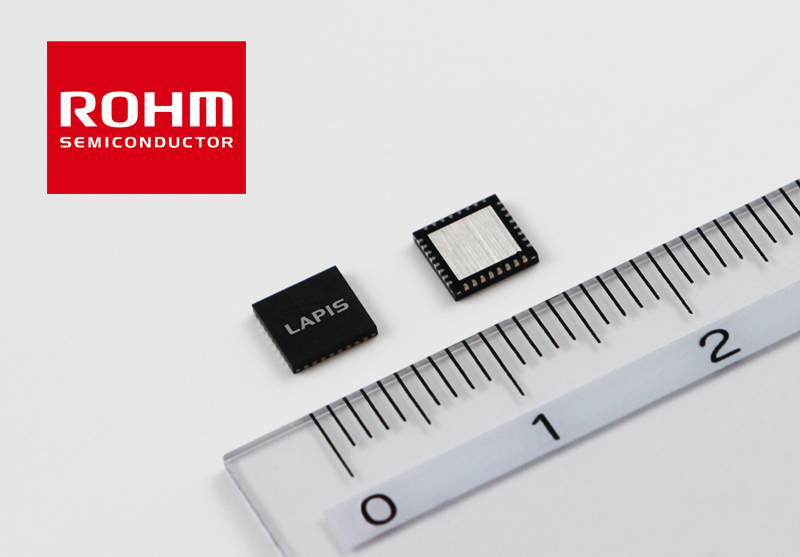 ROHM Group company LAPIS Semiconductor has recently announced the availability of an RF LSI optimized for LPWA (Low Power Wide Area), which is expected to usher in a new area of wireless IoT communication. The ML7404 is the first wireless communication LSI in the industry to feature LPWA dual-mode functionality, supporting both the Sigfox standard (subscription-based LPWA using unlicensed sub-GHz), which has been adoped in more than 30 countries and expanding in metropolitan areas including Japan, and the international protocol IEEE802.15.4K that is extremely robust against interference from the same system and has the capacity to cover more terminals under one network. This dual-mode capability enables use in a wide range of applications/specifications. Communication modules containing this device will be released from partner companies to simplify the development of LPWA-compatible devices that contribute increased IoT adoption. In addition, the protocol stack for IEEE802.15.4k will be provided as open-source from our partner stack vendors. In recent years, LPWA using the sub-GHz band (which is not subject to RF licensing) is attracting attention for IoT applications. However, because the specific communication protocol varies from one country/region to the next, as of yet no method has been standardized from among the diverse array of IoT networks currently in use. LAPIS semiconductor has previously released wireless communication LSIs for sub-GHz specified low power radio base stations ahead of the competition, helping to achieve a smarter world through IoT. This time we developed an LPWA device that supports multiple methods, facilitating the early launch of IoT networks and the effective spread of applications and services. The ML7404 is a dual-mode LPWA wireless communication LSI compatible with both IEEE802.15.4k and the Sigfox standard utilized predominately in Europe. Sigfox, a type of LPWA wireless communication system currently being employed in more than 30 countries around the world. The 802.15.4k standard defined by IEEE is characterized by DSSS based on orthogonal spreading codes and features high interference tolerance from the same system compared with other spread spectrum communication methods. Plus it can accommodate more terminals under the same network. This protocol utilizes the high reliability sub-GHz band that does not require a license. Sigfox uses the BPSK modulation method which is not employed by conventional sub-GHz communication. 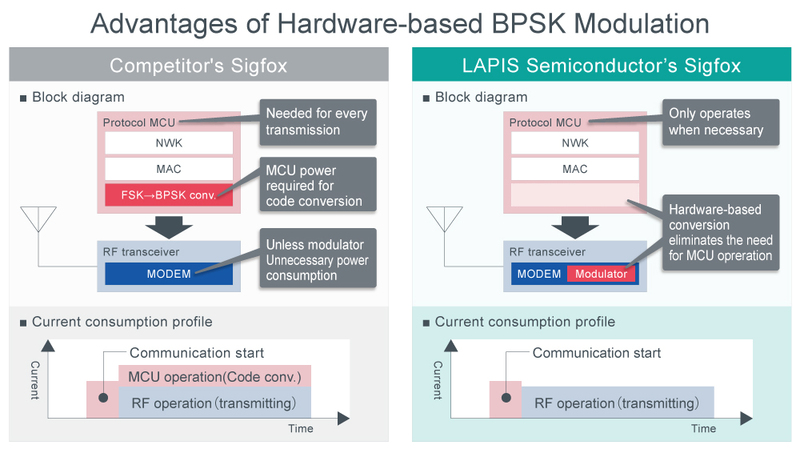 However, because standard Sigfox compliant LSIs do not support BPSK modulation, it is necessary to create BPSK symbol data utilizing control MCU software. Unfortunately, this requires that the control MCU be activated each time wireless communication is performed, resulting in unnecessary set power consumption. In contrast, the ML7404 integrates a BPSK modulation circuit that eliminates the need for the control MCU to operate (in the physical layer) during wireless communication, reducing system power consumption. An optional evaluation kit bundles sample programs (simple MAC) and various test scenarios, with reference module designs currently being prepared. In addition, full support is offered, including manuals and tools that can be downloaded from LAPIS’ website (registration required). And in the future, communication modules integrating the ML7404 along with low power protocol stacks for IEEE802.15.4k will be released from partner companies. Gas and water meters, sensor networks, building health monitoring, smart agriculture, security systems, and other industrial applications requiring long-distance wireless communication. A long-range wireless protocol part of the IEEE family of standards. Sensitivity is improved using the direct sequence spread spectrum method (DSSS). 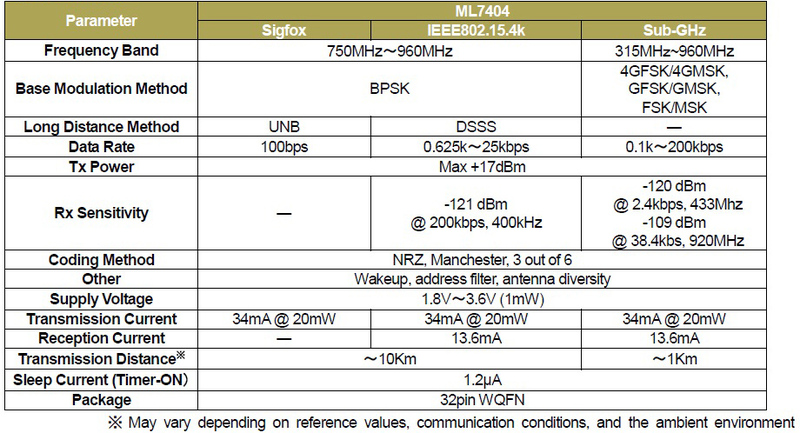 The IEEE802 series standardizes physical layers such as wireless LAN, Bluetooth, ZigBee, and Wi-SUN. A type of spread spectrum method that spreads and transmits baseband signals within a wider band. Pseudo noise is frequency diffused and de-spread during reception, providing greater resistance against interference. *Information in this press releases is current as of the date of the press announcement, but is subject to change without notice. *Please note that the names of companies and products described in this document are the trademarks or registered trademarks of their respective companies and organizations. ROHM Semiconductor, an industry leader in system LSIs, discrete components and module products, utilizes proprietary leading-edge semiconductor technologies along with a completely in-house, vertically integrated production system that allows ROHM to quickly respond to changing needs while ensuring unsurpassed quality and reliability. ROHM has also established a global manufacturing, QA, and sales network in order to deliver stable supply and timely support to customers around the world. LAPIS Semiconductor, acquired in 2008 by the ROHM Group through a spin-off of OKI’s semiconductor business, supplies market-leading logic, memory, and display driver LSIs by leveraging low power consumption, high-frequency circuit, and digital-analog mixed signal technologies. Foundry services are also available for producing custom products for other companies. This entry was posted on Tuesday, September 5th, 2017 at 10:54 am and is filed under Advertiser, News.